π Day is upon us once again! Here are 3.14 pieces of Pi (as it were). 1. 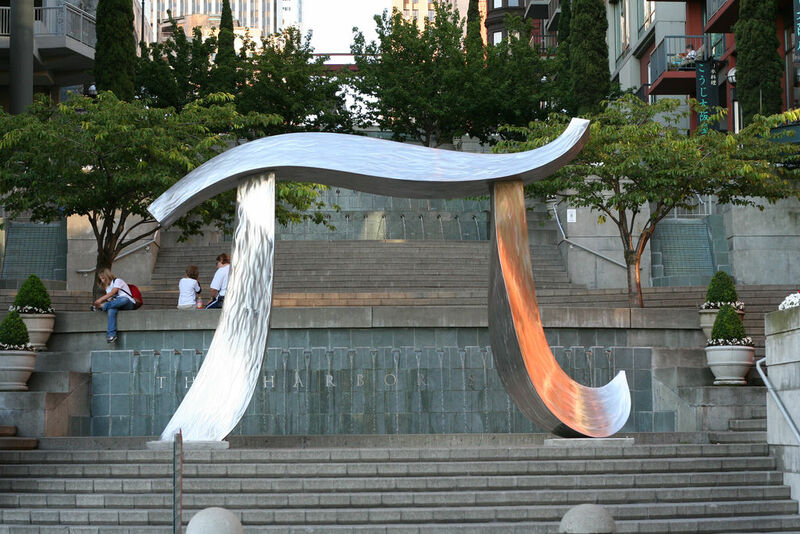 The π sculpture in Seattle, Washington. This website lists π out to its one millionth digit. So does this one. 3. My childhood obsession with this number. I have never cared a great deal about the ratio of a circle’s circumference to its diameter. But, when I was a child, I did memorize π out to its tenth decimal point. I also wrote it out on a piece of paper out to its hundredth decimal point — an item I discovered a couple of years ago when cleaning out my childhood archive (then stored in boxes in my mother’s basement). Why write it out to the hundredth digit? Perhaps I planned to memorize the number all the way out to that decimal? Most likely, its novelty captivated me. I loved paging through the Guinness Book of World Records, and even bought a new edition of the book each year. There, you could learn about Chang and Eng Bunker, or the longest word (that isn’t a technical term or proper noun): floccinaucinihilipilification, which (in case you were wondering) is the act of estimating something worthless. 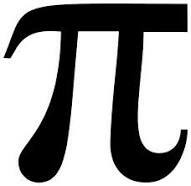 π is not worthless, but my attraction to it derives more from its oddity than its utility. The sarcastic among you might observe that an affection for arcane information is a fairly good description of my profession — college professor. And you wouldn’t be entirely wrong. But you would be belittling the fact that knowledge is worth pursuing for its own sake. Knowledge has no obligation to be useful. Or, to put this another way, do not be discouraged if its purpose may initially elude you. You never know when knowledge might come in handy, or what ideas it might generate. 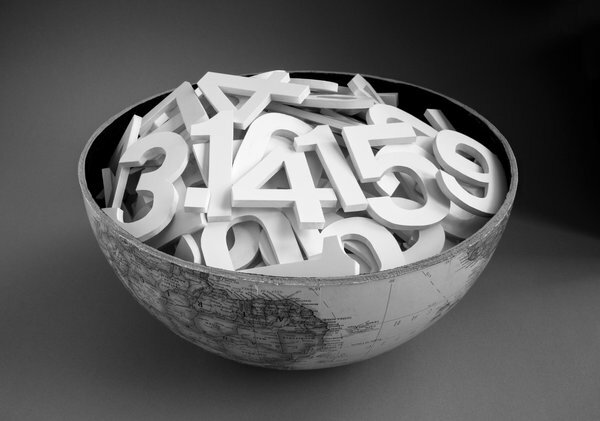 Nine More Kinds of Pi: Happy Pi Day 2015! 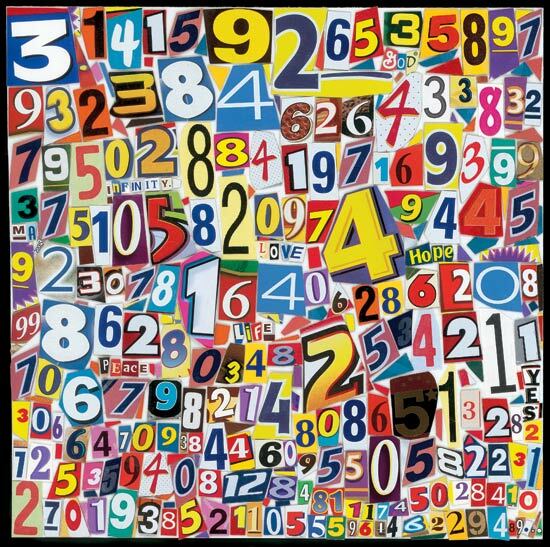 Since this blog takes its name from an artist who wrote about pie and painted π (see last year’s post), I try to offer a little tribute to this beloved irrational number each Pi Day. Today, at 9:26:53 am and pm (twice! ), the date will spell out the first ten digits of the number. Well, it will if you write the date in the American style: 3/14/15, 9:26:53. 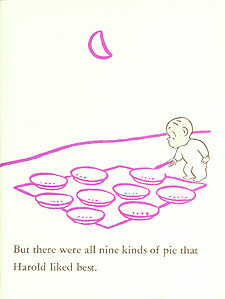 Last year, I managed to offer nine kinds of π / pie. And this year,… here’s another nine! Vasile describes the piece as the “First few thousands digits of pi displayed over radial paths. 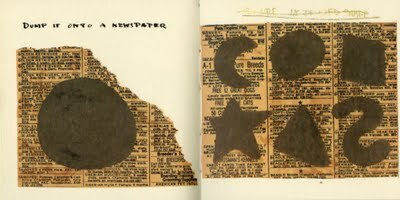 Small size dots.” In an article from last year’s Pi Day, the Guardian shares art from Vasile and others. Yes, these are my superballs, on my bathroom floor. Why do you ask? Also, technically, they’re not superballs (a brand name) — they’re just bouncy rubber balls. But they do spell π out to the 11th digit. Doyle’s photographic portrait cleverly places the number within a circle, half of a globe — presumably to signal global Pi Day. This piece of art accompanied Manil Suri’s “Don’t Expect Math to Make Sense” in the New York Times, 14 Mar. 2015. Located outside the Maths Department at the Technical University of Berlin. 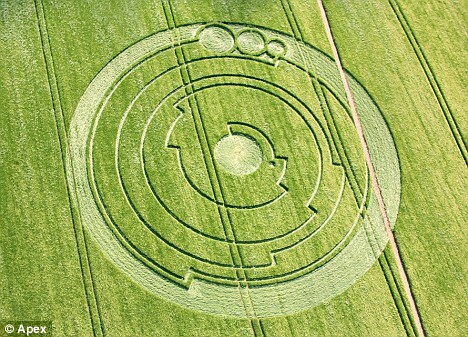 Located in Wiltshire, England, this crop circle is alleged to be a graphic representation of the first ten digits of Pi. Full explanation here, though I’m a bit skeptical of it, myself. Whether or not it spells out Pi, it is an impressive crop circle. Happy Pi Day! 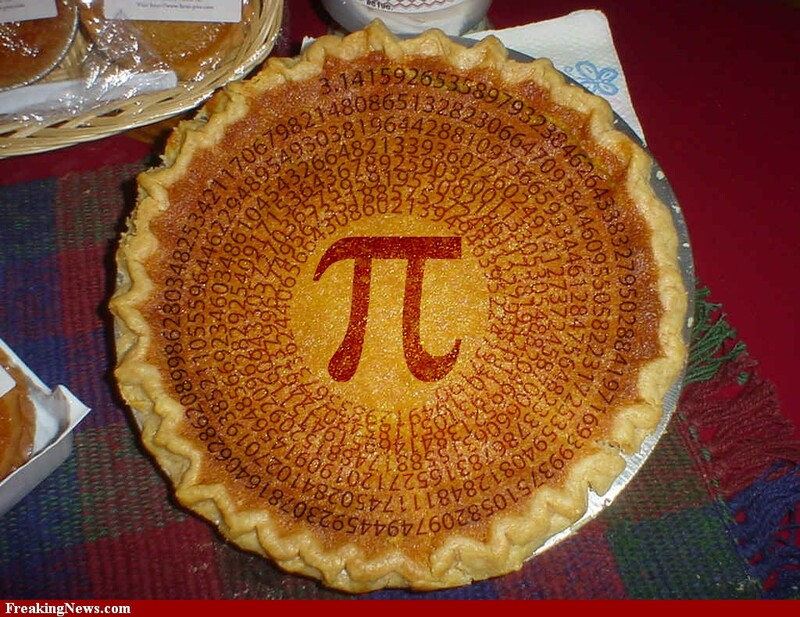 In recognition of 3.14 (today) and this blog’s Pi pie avatar (logo? ), here are Nine Kinds of Pie (loosely defined). 1. The ratio of a circle’s circumference to its diameter: 3.1415926535. When I was a kid, I memorized the number out to its tenth decimal point. On a long strip of paper, I also wrote the number out to about 100 decimal points. Perhaps I thought that learning this irrational number would grant me some greater insight. Or, possibly, I was intrigued by the fact that this simple ratio would be represented by such an unwieldy and unending number. I’m not sure. 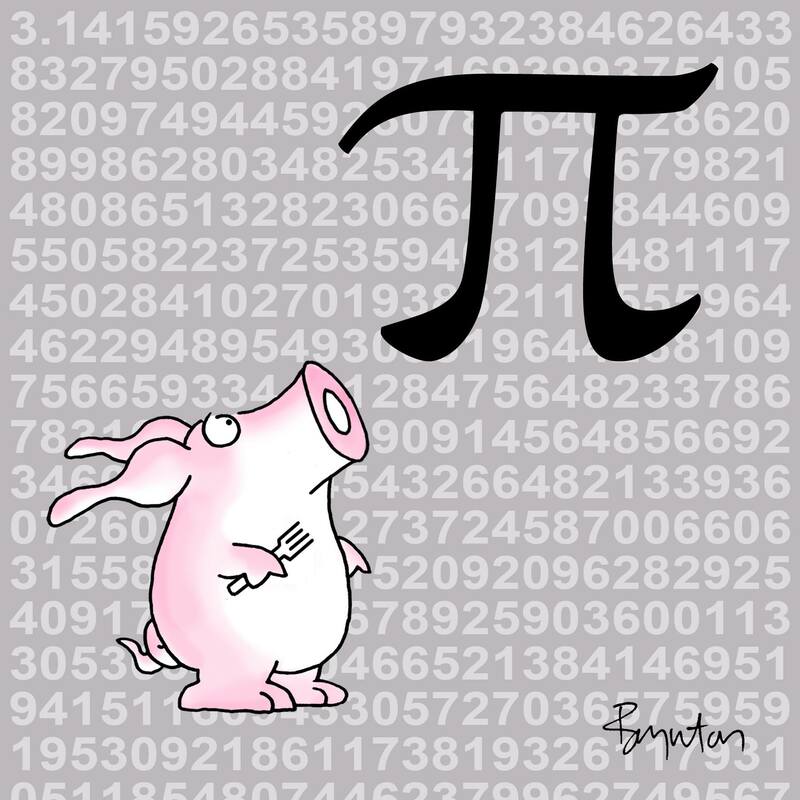 But I still have a fondness for Pi (and pie!). 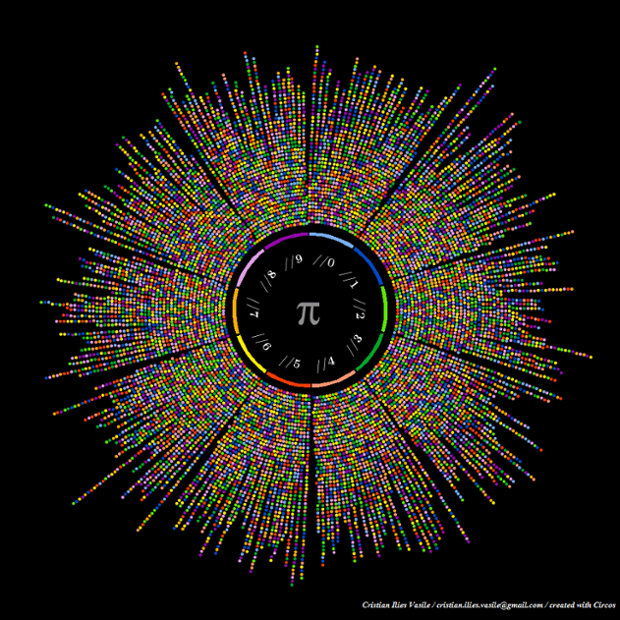 For the truly obsessed, here is Pi out to 100,000 decimal points. 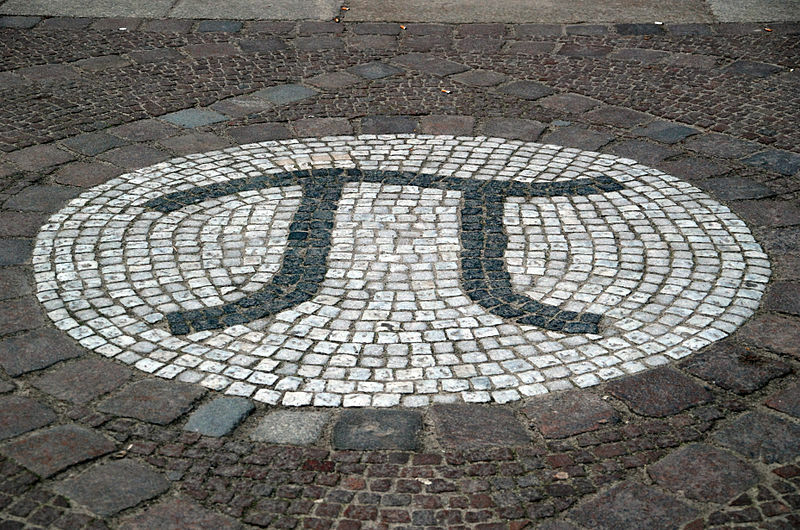 Here’s Pi Day’s “Learn About Pi” page, the Joy of Pi’s “Pi Facts,” and Wikipedia’s essay. 2. Pi was also important to Crockett Johnson. In his later years, he worked on the mathematical conundrum of squaring the circle — a problem that also intrigued mathematician and children’s author Lewis Carroll, a century earlier. 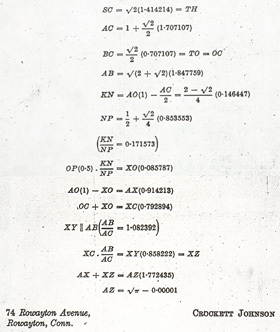 Johnson even published his own original theorem on the subject. He moved towards this answer, visually. 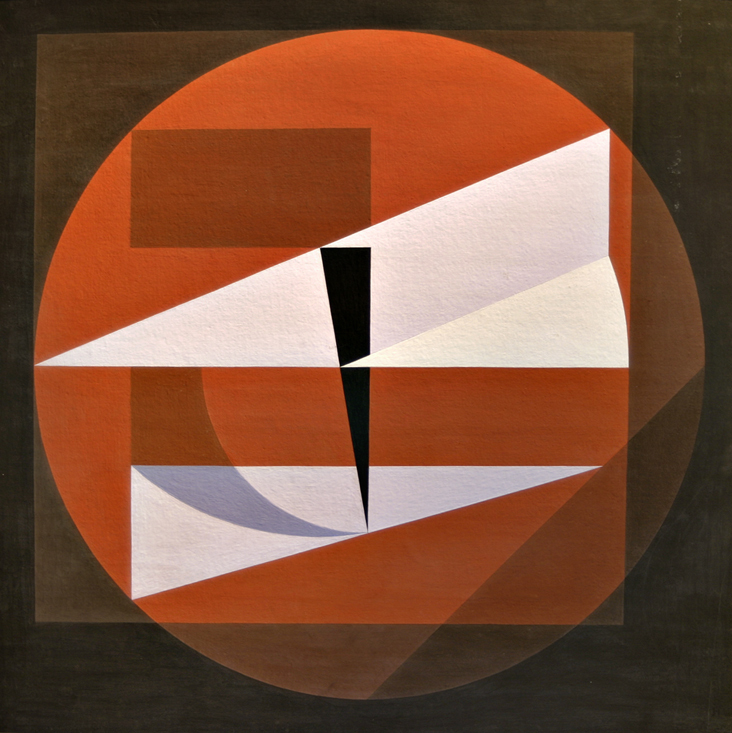 He literally worked out the problem via his paintings, creating many variations on the idea, and ultimately arriving at Squared Circle (1968). 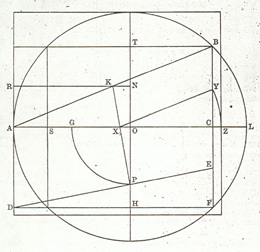 Then, to get the algebraic notation correct, he corresponded with mathematicians, who helped him express his idea in the less visual medium of the formula. It was published in the Mathematical Gazette in 1970. I love the way Johnson’s tone both embraces Harold’s matter-of-fact tone and registers amusement at this claim. On the one hand, the third person narrator (via a literary technique known as free indirect discourse) tells us what Harold is thinking: our narrator is so closely aligned with Harold’s point of view that one could easily swap the pronouns and Harold’s name for “I.” These are Harold’s thoughts. On the other hand, they’re not entirely Harold’s thoughts. Johnson’s deadpan delivery of these lines also underscores the mild absurdity of having nine favorite kinds of pie. 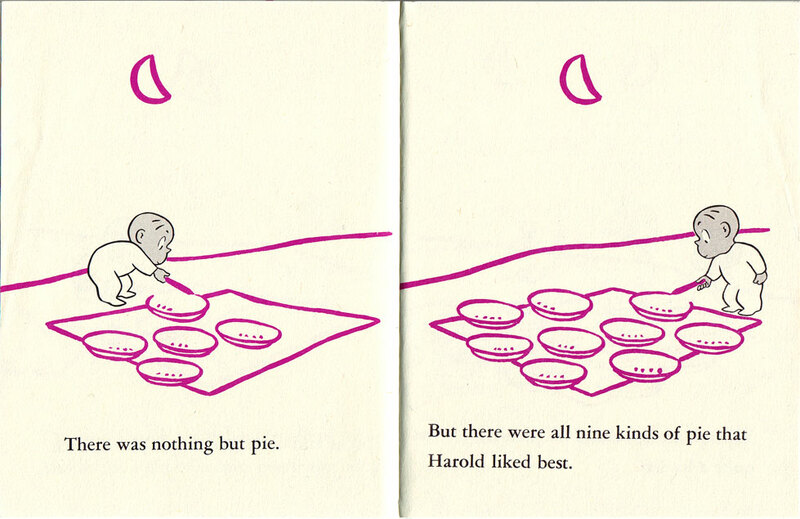 That is, there’s also an awareness here that Harold lacks — specifically, that “nine kinds of pie that Harold liked best” is funny. 4. Or is it? This somewhat baffling pie chart lists Americans’ 10 favorite types of pie. It’s somewhat baffling because the percentages don’t add up to 100 — which is the point of using a pie chart. The circle represents 100%, and then each slice some lesser percentage. But this chart doesn’t. 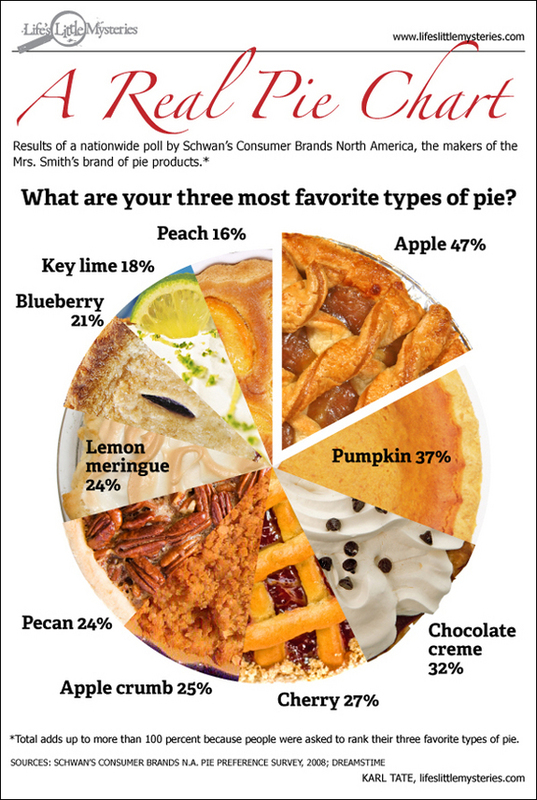 As the chart’s caption explains, the total “adds up to more than 100 per cent because people were asked to rank their three favorite types of pie.” And that still doesn’t make the above chart any more illuminating — though it is pretty to look at. A baked dish of fruit, meat, fish, or vegetables, covered with pastry (or a similar substance) and freq. also having a base and sides of pastry. 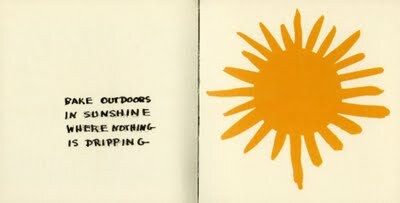 Also (chiefly N. Amer. ): a baked open pastry case filled with fruit; a tart or flan. 6. Care for some Amblongus pie? Since this is (often) a children’s literature blog, here’s a recipe from Edward Lear’s “Nonsense Cookery” (which appears in his Nonsense Songs, Stories, Botany, and Alphabets, 1871). For any readers unfamiliar with Lear’s nonsense works,… you’re in for a treat even tastier than amblongus pie and gosky patties. Go read ’em! 7. 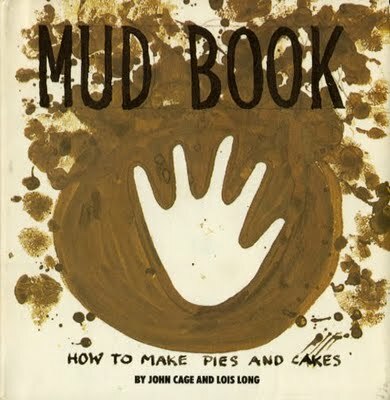 John Cage and Lois Long’s Mud Book (written 1950s, published 1983) offers a recipe for mud pie — and yes, this is John Cage, the composer. Many others have composed music inspired by Pi. Lars Erikson — composer of the Pi Symphony — even sued Michael John Blake (composer of the above piece), alleging plagiarism. Erikson lost. If you like it (and if you don’t), you can buy Michael John Blake’s “What pi sounds like” via iTunes. 9. One could make a long list of pie-themed music, too. The earliest one that comes to mind is “Song of Sixpence” (18th century): “Sing a song of sixpence, / pocket full of rye. / Four and twenty blackbirds / baked in a pie.” There’s A. A. Milne’s “Cottleston Pie,” performed here by Rowlf the Dog on the first season of The Muppet Show (1976). According to an informal and completely unscientific survey of the “pie” songs in my iTunes, pies usually function metaphorically in music. Yes, there are “The Worst Pies in London” (from Sondheim’s Sweeney Todd) and Zoe Lewis’s “Pies for the Public” (from Sheep), but you’re more likely to encounter Don McLean’s “American Pie” (1971), Jay & the Techniques’ “Apple, Peaches, Pumpkin Pie” (1967), the Beatles’ “Honey Pie” (from The Beatles [White Album], 1968), David Wilcox’s “Wildberry Pie” (1991), Death Lurks’ “Happiness Pie” (from The Kids in the Hall soundtrack, 1996), or Louis Jordan and Ella Fitzgerald’s “Patootie Pie” (1946). And what better way to express one’s appreciation for Pi and pie than by baking a Pi pie? 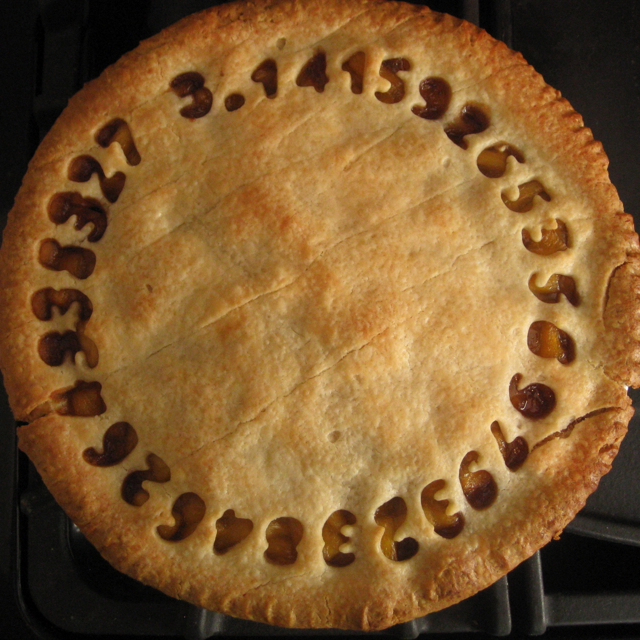 If you want to make one, the Nerdista has a recipe for her Pi pie (pictured below). Happy Pi Day! Let’s have some pie. And Pi, of course. You can also buy Michael Blake’s “What Pi Sounds Like” on iTunes. When I listen to these two works, side by side, I find it a bit of a stretch to claim that Blake has somehow plagiarized Erikson’s work. Yes, they both draw inspiration from 3.1415926535…, but sharing a common influence does not allow us to conclude that one work “stole” from the other. Honestly, the main conclusion I draw from all of this is that Lars Erikson has the heart of a lawyer, and that Michael John Blake has the heart of an artist. In my decade of teaching Children’s Literature at the university level, I’ve learned a lot. But I never feel that I’ve learned quite enough to teach the grad class Critical Approaches to Children’s Literature. I’m grateful that I’m teaching it now and not ten years ago, but it’s one of those courses that makes me conscious of the deficits in my knowledge. 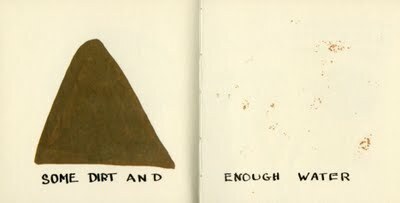 And, on the whole, I see this process as a good thing — because it means that I’m moving closer to mastery of the subject… which, of course, is all one can do. If the x-axis represents mastery, I’m moving along a curve that approaches but never actually intersects with the x-axis. I get ever closer, but never arrive. Above is a graph of y =1/x, taken from this website. The line approaches zero (which, in my analogy, represents mastery of the field), but never reaches it. So, the syllabus for Critical Approaches to Children’s Literature represents one stop along that journey. What’s on it? General themes include: didacticism, pleasure, nonsense, audience, genre, diversity. Theoretical approaches include: formalist, psychoanalytic, feminist, queer theory, cultural studies, and others. 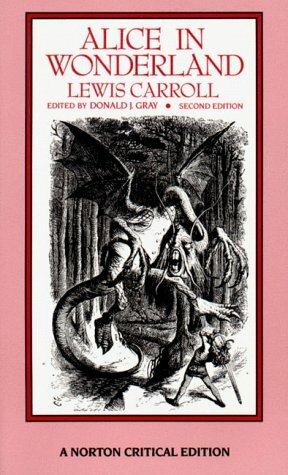 As you’ll see (if you follow the link), we’ll be reading fiction by Helen Bannerman, J. M. Barrie, Francesca Lia Block, Anthony Browne, Lewis Carroll, Jean-Marie Leprince de Beaumont, Maria Edgeworth, Neil Gaiman, Jacob and Wilhelm Grimm, Heinrich Hoffmann, Ann Jonas, Guus Kuijer, David Macaulay, L.M. 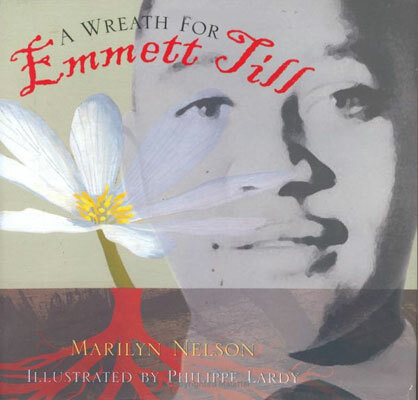 Montgomery, Walter Dean Myers, Marilyn Nelson, Charles Perrault, Jon Scieszka and Lane Smith, Brian Selznick, Dr. Seuss, Mary Martha Sherwood, Shaun Tan, Chris Van Allsburg, and Mary Wollstonecraft, among others. And we’ll gain critical perspective from Robin Bernstein, Michel Foucault, Sigmund Freud, Felicity A. Hughes, Anne Scott MacCleod, Michelle Martin, W.J.T. Mitchell, William Moebius, Mitzi Myers, Perry Nodelman, Walter J. Ong, Lissa Paul, Jacqueline Rose, Jan Susina, and many others. Yes, there are many other texts and theorists that could be included. And I’m sure that I will change the syllabus again next time I teach it. Indeed, I’d like to use Keywords for Children’s Literature, which I co-edited with Lissa Paul (due out from NYU P in May of this year). In case you’re curious, whenever I use a book of my own, I donate any royalties I receive to an appropriate charity. When I used my Dr. Seuss: American Icon (in a Seuss class), that worked out to about $1 per book. So, it’s not much, but I don’t think it’s ethical to profit off of my students in that way. Anyway, I’m sure this syllabus could be better — and not just because I now note a few formatting errors on the Schedule of Assignments. (I’ll fix those before class on Wednesday.) But I also think the syllabus will do the job, as I — and my students — travel along that curve, always approaching, never arriving, but learning a lot along the way. UPDATE: 18 Jan. 2011, 10:45 am. Looking back at what I wrote (late last night, with minimal editing), there’s a major omission that I need to correct: Naomi Wood. My Critical Approaches to Children’s Literature syllabus and course pack borrow heavily from hers. Yes, my class has my own “stamp” on it — and that’s even more true of this year’s iteration of the syllabus. (The initial syllabus, from Spring 2009, even more closely followed hers.) But the general course plan is very much hers. I’m fortunate to have helpful colleagues who share their knowledge, and I want to make sure that Naomi gets due credit here. So, Naomi: I doff my hat to you! And, yes, it is a red-and-white-striped topper. How ever did you know?